I was an indentured apprentice watchmaker from the age of 16 - a copy of my indentures are available to view. 41 years experience on the workbench means that there is no job too big or too small for me to restore. I worked for Omega in their London workshop as a watchmaker, servicing all Omega models including chronometers, tuners and chronographs. 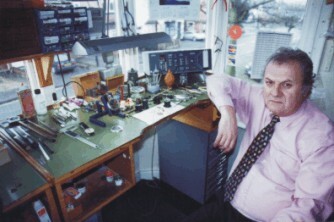 From there I moved to Bolton, Lancashire, to be workshop manager over 6 watchmakers. Our clients were the leading retailers of Northern England. We serviced Rolex, Cartier, Longines and all other quality timepieces. I then left the North of England to return to the Midlands and set up a trade repair shop. I continued in this up to 12 years ago when I set up my present premises. I now do a little trade work - but most of my work comes from the general public. Apprentice served with Geo Bouverat, Hockley, Birmingham, UK. Girard-Perregaux and Bernex watches. Attended Birmingham Jewellery School for 3 years, gaining a certificate in Horology in all 3 grades. BULOVA tuning fork repairs course. ETIC qtz watch repair course.